Power-up and power-down light effects produced by a string of 64 super-bright LEDs that ignite sequentially inside the blade. Five motion sensor controlled sound effects digitally recorded from the movie: power-up, idle hum, swing, clash, and power-down. Three built-in motion sensors for super sensitivity: 2 for detecting movement and 1 for detecting the impact of the blade. Sturdy blade is permanently attached to the hilt. After dropping his blue lightsaber (along with a hand) in The Empire Strikes Back, Luke builds his own lightsaber, as all Jedis are supposed to do anyway. The blue lightsaber was the one used by Annakin Skywalker who (spoiler alert, ha ha) was actually Luke's father, Darth Vader. So, in defeating Luke, Vader actually lost an expensive weapon of his. Little lesson here boys and girls: If you're going to cut off your son's hand, make sure he's not holding your old lightsaber over a gaping chasm. The green lightsaber was built by Luke on tatooine, following the same techniques that had been used by Jedi for centuries. By building his own lightsaber, Luke accomplihsed what is known as the "Lightsaber Creation Trial," one of the final trials in the long list of trials needed to become a Jedi. 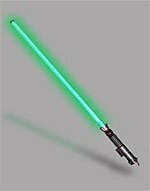 This lightsaber is a green one, which is supposed to indicate a Jedi who specializes in the force, more than martial skills or diplomacy. It's possible that the trendy Luke just wnated to mimic his favorite Muppet, Yoda, who also had a green lightsaber. There is much debate over what kind of crystal Luke used to make his lightsaber green, but common theory seems to hold that green crystals are gems known as "Corusca," from the planet Yavin. Leaving fantasy for a moment, rumor has it that there really were no green lightsabers in George Lucas' universe until they began filming return of the Jedi. Luke's new lightsaber was supposed to be blue as well, but Lucas realized that a green saber would show up much better than a blue one, so he changed the color. 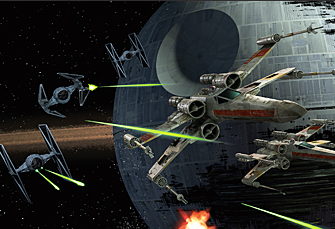 Lightsabers are probably the oldest of the known sword types. Yes, that's right, oldest. They were, after all, created a long time ago, in a gala... ahem. Well, you get the point (please excuse that last sentence and what was, perhaps, the worst pun ever jotted down onto this website). As far as the history goes, if you don't know, then I fear it's hopeless. Go rent some movies. Oh alright, I'll try. Lightsabers are the chosen weapon of the Jedi, a powerful order of knights in the six Star Wars movies created by George Lucas. The colors of the lightsaber said much about a jedi. Each color had its own symbolism. Anakin Skywalker started his career with a blue lightsaber. When he turned to the Dark Side, he switched to the red blade that only Siths use. Jedis are supposed to build their own lightsabers when they come of age, and use this lightsaber for the rest of their days, or until someone cut their hand off and the lightsaber was lost, which seemed inevitable for most Jedis at one time or another. To read more than anyone should ever read about lightsabers, visit the Wikipedia.org entry on Lightsaber history.